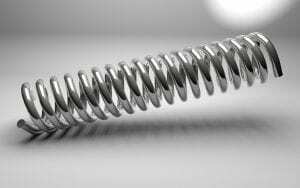 What are the Most Common Spring Wire Materials? When choosing the right spring, selecting the best spring wire for your application is a critical step before manufacturing. Below are some of the most common spring wire materials and their unique characteristics to help you make an informed choice. Stainless steel springs have a low-stress relaxation and resist corrosion. They have good strength at moderate temperatures and are resistant to heat, but do not perform well in subzero applications. Extension springs are most commonly made from stainless steel, although they can also be made of many other types of spring wire. Extension springs absorb energy and provide resistance to pulling. As the name suggests, an extension spring stretches as a load is applied to it. Applications for extension springs include carburetors, trampolines and farm machinery. Oil tempered wire is cold drawn and heat treated before plating. Ideal as a general purpose spring wire, it is often used for torsion springs. Torsion springs operate through the use of torque and twist as the force is applied to their stored energy. Classic uses include clothespins and mousetraps. Large torsion springs are used in garage doors and vehicle suspensions. Copper-based alloys include brass, bronze, and beryllium. Many springs are made from these various types of copper, and they will all have very different characteristics. Spring brass will help keep costs low and has a high degree of conductivity. However, it is known to have relatively poor mechanical properties. Phosphor bronze is a popular choice because of its ability to withstand repeated flexing. Beryllium copper is able to be hardened, has a high yield and can withstand high fatigue. Compression springs, one of the most popular spring types with a wide variety of uses in many industries, are often made from beryllium spring wire. They are designed to resist force and get shorter as the load is applied. Springs come in all sizes and are made from many different types of spring wire, depending on what they are being used for. If you aren’t sure what kind of spring wire you need, contact the experts at James Spring. We will take the time to help you make the best choice for your specific application.